Crime Watch: CrimeFest 2010 about to kick off: are you going? CrimeFest 2010 about to kick off: are you going? In less than two days, CrimeFest 2010 kicks off. The International Crime Fiction Convention, with the tagline "where the pen is bloodier than the sword", is being held in Bristol, England from Thursday through Sunday (20 to 23 May 2010). There are dozens of great events over the four days, and many, many crime, mystery, and thriller writers in attendance; a real mix of big names, acclaimed newbies, and lesser-knowns. The featured guests are French novelist and award-winning screenwriter Tonino Benacquista and Inspector Morse creator Colin Dexter, who won the CWA Cartier Diamond Dagger for Lifetime Achievement in 1997. Skimming through the full programme, which you can browse here, several other interesting names leap out, such as 'Inspector Kubu' creators Michael Stanley, CrimeTime editor Barry Forshaw, Icelandic crime writer Yrsa Sigurdardottir, Big Best from Badsville's Donna Moore, Zoe Sharp, Ann Cleeves, Matt Hilton, and Martin Edwards, amongst many, many others. On the Friday night at 5:30pm, CrimeFest hosts the CWA Dagger Shortlist Announcement Party, and I understand the eDunnit, Last Laugh, and Sounds of Crime Awards will also be presented during CrimeFest, at the big Gala Dinner on the Saturday. You can read the shortlists for those awards here. CrimeFest is touted as a convention for people who like to read an occasional crime novel as well as for die-hard fanatics. Following the hugely successful one-off visit to Bristol in 2006 of the American convention Left Coast Crime, the hosts were encouraged to continue with a similar annual event and created CrimeFest (the first convention being held in June 2008). 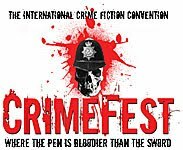 CrimeFest is quickly becoming one of the most popular dates in the crime fiction calendar, drawing top crime novelists, readers, editors, publishers and reviewers from around the world and gives delegates the opportunity to celebrate the genre in an informal atmosphere. Sounds like a great few days. So, who's going to CrimeFest? Have any of you been to any such crime writing festivals (Harrogate, CrimeFest, Left Coast Crime, Bouchercon, Malice Domestic etc)? If so, what do you think? What do you like/dislike about such festivals? Thoughts and comments welcome. I went to Left Coast Crime in Hawaii last year, Melbourne Writers Week for a couple of years, and Adelaide Writers week (every 2 years in "even" years) if I can get there. LCC was a unique experience because it was held entirely in one hotel. All experiences have been great but I think LCC was possibly the best.